Here’s another video from Chunky Mark, the Artist Taxi Driver. In this one, Chunky Mark delivers his rant, which is nevertheless very acutely observed, on the Labour coup. He describes why the coup plotters hate Jeremy Corbyn, and how absolute undemocratic they are. He observes that the right-wing – the Tories and the media didn’t want Corbyn from day one. The Labour MPs hated his anti-war stance, including his rejection of Trident, his rejection of austerity, his support for building ‘not-for-profit homes’, nor for standing up for free education and holding the wretched vulture capitalists to account. The Right and the Labour MPs hate everything he stands for and his supporters. And the forthcoming Labour election, the Chunky One declares scathingly, is a fraud. He states that the coup started with the resignation of Hilary Benn, but Angela Eagle had already bought and paid for a website with the title ‘Angela Eagle for Leader’. The Coup Plotters have raised the membership fee from £3 to £25, and excluded 130,000 new members. The NEC – the head council of the Labour party – has also banned constituency parties from holding meetings. They’ve suspended the largest local Labour party, that of Brighton, and launched an algorhythm to search social media to make sure that Labour party members do not use words like ‘traitor’. If they do, they are suspended. Corbyn’s supporters have been denounced as ‘Trots’ and ‘rabble dogs’. Chunky Mark says that somebody observed that they’re living under a Tory government, they didn’t vote, going through a Brexit, that they didn’t vote for, and have a Tory prime minister, that nobody voted for, but that’s democracy. Now the one person, who could be democratically electable, has to be voted for again, because the Labour MPs don’t like him, and want to get rid of him. Chunky Mark rightly points out that we should be fighting the current, extreme Right Tory government, which is attacking people’s rights. The Labour Coup, however, have sent this country backwards. He states that the Coup Plotters’ dream seems to be to suspend the membership, leaving only the Labour MPs and their donors. He quotes the journalist, John Harris, who said, ‘There is a fetid cloud of acrimony over Labour, and it is the reek of death.’ The Chunky One observers that the plotters would rather see people’s vision of an alternative, better world die than attack the status quo. It’s all gerrymandering, backed by lies and smears. The massive increase in membership fee discriminates against the low waged, the unemployed, students and the elderly. This is the Labour election fraud. Chunky Mark’s right. This is the parliamentary Labour party, the official Labour party wedded to Tony Blair’s neo-liberal vision, the ‘New Labour’ that came into being with the removal of Clause 4, the article providing for nationalisation of the means of production, trying to defend itself from Old Labour, now that the neoliberal vision is being increasingly found to be bankrupt. New Labour came to power impressed with Thatcher’s popularity, and convinced by her own threadbare ideas. State control and planning was rejected, along with all but a minimal welfare state. The rich, private industry and the media barons were to be courted and won over, as without them, Labour, it was held, was unelectable. And besides, only private industry knows best how to run the economy. Except that it’s become blindingly evident that they don’t, and more and more people are aware of this. 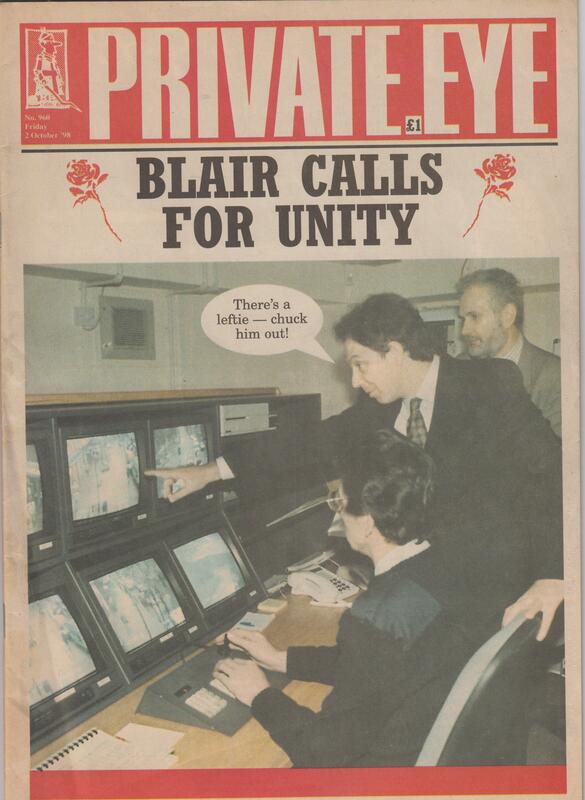 But it runs against everything the Blairites have instilled in the party for the last quarter of a century. And I wonder, in some of this, how much simple careerism plays a part. There was already a revolving door between business, senior civil servants and ministers under John Major. It became wider, and even more sleazy and corrupt under Blair. And now MPs see the promise of a nice, lucrative career in the industries they helped to privatise, and win government contracts after their parliamentary careers have ended, disappearing. Berthold Brecht once remarked of the East German Communist party, when they clamped down on their people after they dared to demand democracy, that the Communist party had voted democratically to dissolve the people and elect another. This is what an authoritarian and careerist Labour party machine is trying to do to its membership. They want to destroy the party, rather than see themselves and neoliberalism and its horrors fail. More proof of Boris Johnson’s vaulting political ambitions, or at least, his galloping megalomania. Looking through the Cheltenham branch of W.H. Smith a few weeks ago, I found on the magazine racks a glossy brochure devoted to Boris. Simply titled Boris Johnson, it was very much like the type of glossy specials brought out to celebrate a royal event, like the queen’s coronation, the jubilee, or a royal wedding. It also reminded me of some of the material that came out during Thatcher’s reign. Despite its highly offensive and distasteful subject matter to anyone on the Left, and to a few genuinely caring Tories, for that matter, there was a point to it. Most of these came out when Thatcher celebrated 13 years in power. She was at that point the longest serving British prime minister, and the first woman to hold the office. In those respects she deserved to be commemorated. Or at least, she had as much right to be as every other holder of the office. Boris, on the other hand, is still some way away from that lofty post. He’s been editor of magazine, The Spectator, though so was the fictional Jim Hacker of Yes, Minister and Yes, Prime Minister fame. And part of what made Hacker funny was that essentially he was a nondescript, junior MP, who was given a political office – the Minister for Administrative Affairs – who imagined himself as something far greater and grander. Like Winston Churchill. His voice took on the Great Warleader’s inflections and tones when he started to imagine the glorious political future stretching ahead of him, and the country under his benign leadership. Which makes you wonder somewhat about Boris. Does he also stand in his office, posing as Churchill, trying to capture the great man’s tones and mannerisms in his office while no-one’s looking, conjuring up before his inner eye a magnificent future in which Maximus and UNUM have saved the government millions by killing off all the disabled through starvation, and the poor and proles are properly confined to their own ghettos and know their place? The first part of that grim scenario is unlikely. Johnson has gained much of his popularity through posing as a loveable, bumbling oaf. He makes mistakes, but he means well, and it’s all a good laugh, so why not vote for him? In actual fact, while I’ve no doubt some of his accident prone persona is genuine, it strikes me as exaggerated and played up to get public sympathy. And people who know Johnson say he is a steely political operator with a vicious temper, quite different from the amiable fool that appears on Have I Got News For You. The second part of that scenario, on the other hand, is all too plausible. It seems very clear that Johnson covets the role of PM, and would like to unseat, or at least, succeed Cameron in that role. And like the rest of the Tories, he has an absolute contempt for the poor and working and lower middle classes. It’s indicative of the contempt he feels for the people of London that he decided he couldn’t afford to pay the firemen a proper wage, but could buy three water cannons. Cheltenham is also on the edge of the Cotswolds, and the magazines looks like it was designed to appear to the Cotswold set of very wealthy that live outside the town, reading magazines like Cotswold Life. Cheltenham itself is rather different, and has a large underclass, very like other towns such as Bath, where the very rich and the poor live practically cheek by jowl. It also reminds me of the jokes about Adolf Hitler in Red Dwarf, when a set of photographs mutate so they can use them as a time machine. One of the photos is of Hitler, who Kryten recognises as he was featured in one of Rimmer’s specialist magazines: Fascist Dictator Monthly. The Fuehrer was Mr October. It also reminds me of the fan magazine devoted to the evil Torquemada, the genocidally racist grandmaster of Termight – Earth, thousands of years in the future – in 2000 AD’s ‘Nemesis the Warlock’ strip. As Torquemada was the absolute, totalitarian ruler of this nightmarish future Earth, he also had his fan magazine, with the slogan ‘Let’s talk Torquey’, and fan conventions. The last seemed partly modelled on the comics convictions that have been going since at least the ’70s. Johnson is far too clever to give in to the urge to make racist rants like Torquemada. He merely fronts TV series on the splendours of ancient Rome and appears as a genial guest on popular satirical quizzes. But this is evidence of his megalomania, his driving ambition and his need for popular acclaim, as well as the popular votes, nonetheless. Be afraid. Be very afraid.